1) Place all of the ingredients, except for the water and chicken, into a large pot. Put the chicken carcass on top of the other ingredients. Fill the pot with cold water until it just covers the chicken. 2) Over high heat, slowly bring the water to a boil. Once boiling, reduce the temperature to a simmer. Using a large slotted spoon skim off the foam as it appears at the top of the stock. Continue to skim stock until there is very little foam on top, Mostly during the first hour. 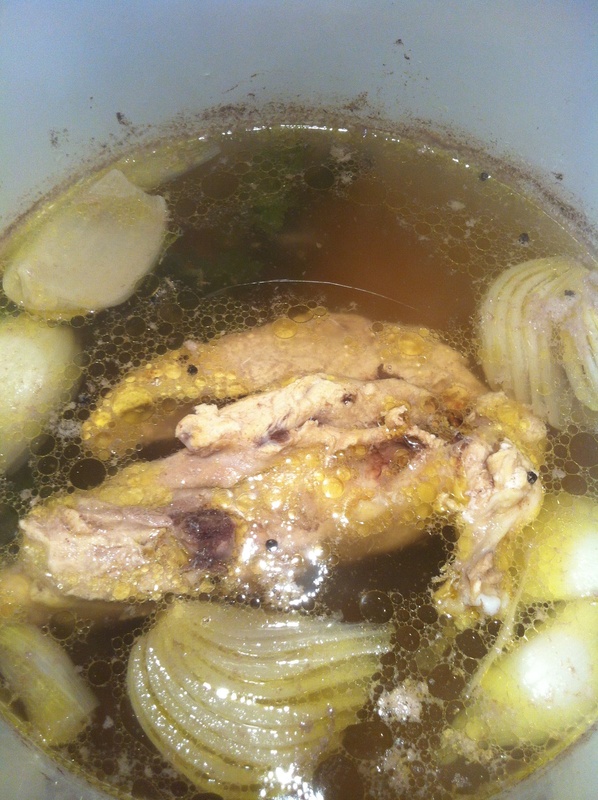 3) Continue to simmer the chicken stock until it develops a rich, chicken flavor, about three hours. Do not cover the pot or add water as the stock simmers. 4) Remove the pot from heat. Pour the stock through a mesh strainer into another container. Cool the strained stock as quickly as possible. An ice bath will cool the stock faster than your refrigerator. Fill your kitchen sink with ice and water. Place the container in the ice bath and stir constantly until the temperature is reduced to 70 degrees. Refrigerate. 5) As the stock cools, your stock may develop a layer of fat on the top. Leave this on until you are ready to first use the stock. This will protect it from exposure to the air. When ready to use, just spoon off the fat. 6) Chicken stock will keep for about a week refrigerated. It also freezes well. If freezing, transfer stock to smaller containers, so you only have to defrost what you need.